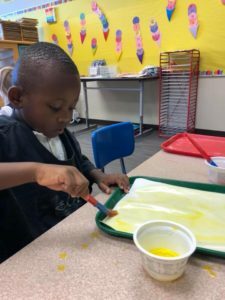 Legacy School’s Preschool and Pre-Kindergarten classes are theme-based and adhere to accreditation guidelines established by the National Association for the Education of Young Children (NAEYC) and Nebraska’s Department of Education Standards. All Preschool and Pre-K teachers hold college degrees in Education and a teacher’s assistant is always in every classroom. Each weekly theme serves as a framework for organizing content area learning. Students spend their time at school learning and playing in each of the bright, inviting subject-based classrooms. The Preschool and Pre-K curriculum is designed to directly relate to the students. Rather than purchasing a “plastic” curriculum that is used year after year, Legacy School gives thoughtful consideration to individual students by creating and changing lessons as students’ needs and levels change. 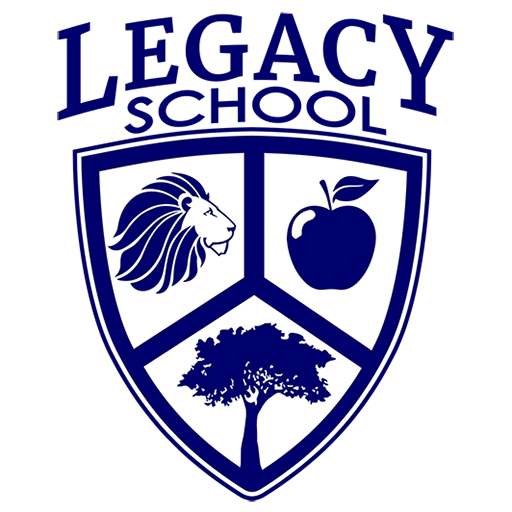 Legacy School is well regarded, with a long-standing reputation as the best preschool in Omaha. New students are almost always referred to the school by a family who has had firsthand experience with Legacy. Legacy School’s Preschool classes are designed for children who are 3 years old by October 15th. The program was developed knowing 3-year olds like to work at their own pace, as they inquire about the world around them. Each class fosters and engages the fantastic imagination of the 3-year-old, while offering socialization, movement, and hands-on experiences. Small class sizes gives preschool students the much-needed individual attention they deserve. Pre-Kindergarten classes have been developed for children who are 4 years old by October 15th. Pre-K teachers know how inquisitive and thoughtful 4-year olds can be. The small class sizes foster an atmosphere that gives teachers the opportunity to provide differentiated instruction. This type of education allows students to make necessary strides in their cognitive, emotional, physical and social development. 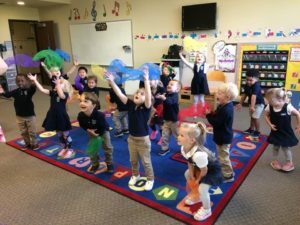 Legacy School’s Junior-Kindergarten class is dedicated to children who may have already completed a Pre-K class and will be entering Kindergarten the following year. Students must be 5 years old by November 15th to enter Junior-Kindergarten. With a small class size, students are given the specialized attention needed to flourish emotionally, socially and cognitively. 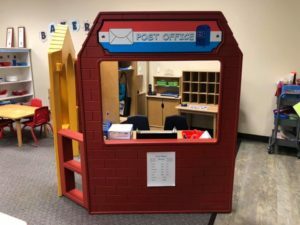 Because of this exciting, multisensory educational environment, Junior-Kindergarten students are enthusiastic about learning and become shining examples of school readiness. 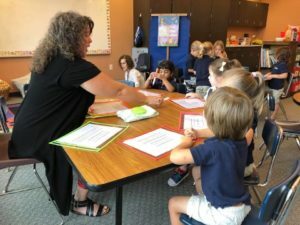 The afternoon Enrichment Program at Legacy School allows students who are in Junior-Kindergarten or Pre-Kindergarten to experience a full day of learning. The Enrichment program is multi faceted, involving Spanish, STEM, and Project Based Learning. Spanish introduces students to the Spanish language and the cultures that speak Spanish. Students learn the language, experience authentic music, create crafts in relation to the heritage, make and taste foods, learn about climate and geography, touch artifacts and celebrate traditions. STEM classes offer hands-on experiences with technology and math. Students tinker and build with a variety of manipulatives and engineering based centers. Project Based Learning (PBL) gives students the opportunity to create solutions to their problems. Students spend days to a week solving real life problems. Many of these projects are displayed throughout the year in the lobby or at the extended care desk. Parents may opt to have their child stay for one to five Enrichment classes a week. In the Library, reading and writing skills are promoted through pictures, play, print, guided reading, handwriting, journaling and phonological awareness activities. Teachers use literacy to enhance exposure and plan direct teaching lessons which provide oral and written language experiences. Centers include writing, alphabet recognition, listening, interactive library, phonics and age-appropriate literature. Young children are curious by nature. Legacy School’s Discovery Room allows for the expansion of how a student relates to his/her world. In the Discovery Classroom students explore and investigate through Math and Science activities. They learn math concepts necessary to become powerful problem solvers. They become young scientists through experiment and wonder. Hands-on activities evolve from student interest in their environment while in the Discovery Room. In the Drama Room, children use their imagination while in the various centers: house play, construction site, grocery store, veterinarian clinic, transportation center, theater, post office, flower shop, fruit and vegetable stand, doctor’s office and restaurant. Research in early childhood education is abundant on the importance of play. When children just simply play, they have a positive influence on their physical, cognitive and psychosocial development. The Drama Room gives Legacy students vast opportunities to learn through dramatic play. Every class at Legacy School experiences weekly music education. Legacy’s music class goes beyond simple song singing and finger plays. Like all other Legacy programs, the music education program teaches higher level skills through age appropriate lessons. Students are learning rhythm, tone, tempo, pitch and music reading through song and dance. Materials utilized are piano, guitar, individual student instruments, scarves, rhythm sticks and many other “hands-on” educational items. In the Art Classroom, students refine their small motor skills, eye-hand coordination and the power of observation by creating and manipulating artworks and experiencing all modes of art using tools such as: chalk, sponges, markers, scissors, glue, paint, crayons and clay. Students are active learners, as art is a hands-on activity that expands the imagination and exercises creativity. The Art Classroom allows for children to learn the fundamentals of art, recognize patterns, colors and shapes, and gain an understanding of composition, balance and symmetry all while having fun! Young children require multiple opportunities for physical activity. In the indoor gymnasium, students gain control over their gross motor movements using the balance beam, tunnels, scooters, hula hoops, balls and other gym activities. They are working on large muscle movements to run, jump, throw, catch and kick. Legacy’s gym allows for indoor exercise when students cannot be outdoors on the 11 acres of land. Legacy School’s Science and Nature Center provides students with hands-on educational activities led by Science teacher, Mrs. Miller. Students explore topics such color mixing, how magnets attract and repel, water absorption, and many more science based topics. Students also study different animals and reptiles as they appear in their natural environment and throughout the 11 acres. Legacy currently has 4 goats, 6 chickens, bearded dragons, tortoises, geckos, green anoles, bahama anoles, and a corn snake. Research shows children need connections with the natural world as part of their healthy growth and development. 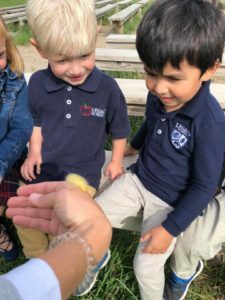 Legacy School connects our students to nature through the 11 acres of outdoor learning areas. Students take an active role while they participate in exciting hands-on, motivational activities such as giant tree block building, nature art area, sand play, tree stump stools, nature trails and more. Rocks, shells, pinecones, magnifying glasses, insect specimens, shovels, twigs and other nature tools are all part of the educational fun in the outdoor nature experiences. Outdoor play is fundamental to any early childhood program. There are multiple developmental tasks that children must achieve that can most effectively be learned through outdoor play:exploring, risk-taking, fine and gross motor development. In a culture that is seeing less and less outdoor play and more TV/computer time, it is critical for the health and development of children to get outside. Students at Legacy School practice gross motor skills while outside on our 11 acres. 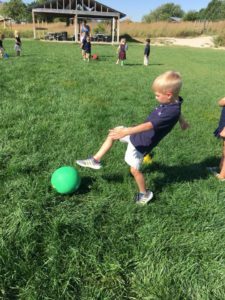 Legacy School’s property includes two playgrounds, a baseball field, soccer field, obstacle course, basketball court, Gaga pits, horseshoes, volleyball court, swings, teeter-toddlers and walking trails. Climbing, sliding, kicking, catching, throwing and other outdoor recess activities are all part of the fun!